This new series features "Apex Predators," from giant otters to jaguars. I received the Harpy Eagle for review. Harpy eagles are really cool. I didn't really learn anything new in this book, but I enjoyed revisiting these cool creatures. This rain forest eagle is one of the largest birds of prey, nesting in tall rainforest trees and preying on monkeys, sloths, coatis, and other medium-sized creatures. My favorite part of the harpy eagle is the way they can pop up a circle of feathers around their face. This has a practical use - directing sound to their small ears - but it also looks simply adorable. It's this big fluffy circle (with, you know, a razor-sharp beak in the center). 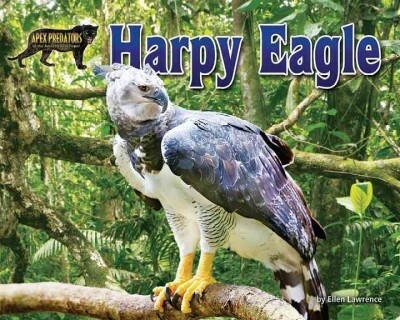 In addition to the facts about the harpy eagle, its habitat, prey, and life cycle, there are also inset facts about the eagle and the rainforest, questions to get readers thinking about the text, a science experiment, glossary, and index. Verdict: If you're looking to diversify and add to your animal books, this series is a good choice to fill out some more unusual predators. I first discovered this funny beginning chapter book trilogy almost 10 years ago. Not only was it hilarious and spot-on, it was not overwhelmingly British and it has a guinea pig! Alice, in addition to her wacky little sister Rosie and her supercilious older brother Oliver, has a problem - she can't pronounce "animal". When her teacher announces that the class topic will be farm animals, Alice gloomily looks forward to a semester of teasing. 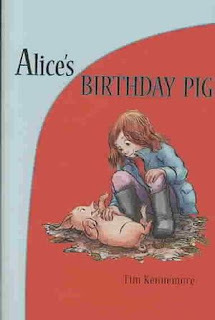 And when her class takes a field trip to a farm and Alice finds an unexpectedly adorable little pig, she knows that more disappointments are in store. However, in a surprise ending, Alice gets her a pet, Oliver is vanquished, and even Rosie is temporarily dismayed. This is a classic "in the middle" story; Alice's trials and triumphs as a middle child and her longing for a pet of her own will resonate with children no matter their birth order! The illustrations are sweet and just a little zany, just like Alice's family. Who will read this? Beginning chapter readers who are fluent but not ready for longer books; kids who enjoy funny family stories, and any kids who have sibling woes. Bring it back? Well....I'd love it to be available, but I have to admit it has not circulated in my library as I'd hoped, even when I used it for a book club. It's a little challenging for the reading level of most kids who are reading beginning chapters and there are a lot of beginning chapter series out there. It's a great read-aloud but there are plenty of copies still floating around. Availability? The trilogy is out of print, but it's available as a digital audio (which I personally own). My library still owns the hardcovers, which are in good condition. The last week of summer reading is finally here. Things have slowed down a lot, but I am dealing with a lot of extra stuff. More interesting things to come later. I was really excited about the first book in this series, Ancient Egypt, but when I tried another I was a little disappointed. This book follows the format of the other titles. 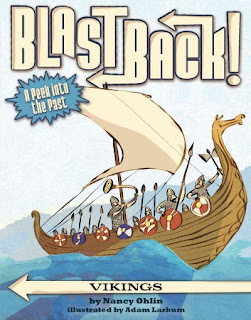 It starts with a brief history of the Vikings, then explains their history in different countries, culture, politics, and family structures. 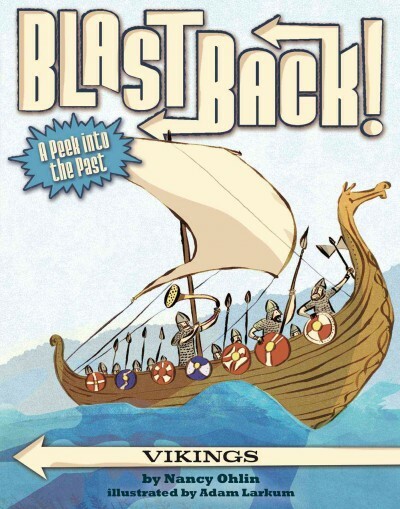 There's also a chapter on the Icelandic sagas and the legacy the Vikings left. Larkum's line drawings decorate the pages, illustrating ships, clothing, and battles. Somehow, even though this is a favorite topic of mine, I found it really...dull. It just didn't have the pizzaz and humor of the first title I read. It felt more like a textbook than narrative nonfiction. I can't really say why; maybe it's because I have more familiarity with the topic, maybe I just wasn't in the mood. Regardless, I'm still recommending this series. 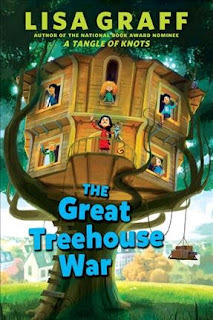 Even if one entry is a bit more blah than the others, it's still a great choice for beginning readers who like Magic Tree House and history. I'm going to see if I can get some feedback from readers and find out if they felt the same about this title or if I was just having a bad day. Verdict: A strong purchase for your beginning chapter sections. I'm in two minds of this title. I really wanted to read it; there are very few books featuring homeschooled kids and even fewer featuring non-ex-hippy homeschoolers. On the other hand, no library in my consortium or the entire interlibrary loan system had it and it's from a small press so is a little more expensive. I ended up purchasing an ebook on sale and settled down to read it with an open mind. Azalea is used to picking up and moving every year or even every few months. She mostly enjoys being homeschooled and she likes the relationship she has with her parents. She's not so sure about her increasingly grouchy teen sister though. When the family moves up to Portland, Maine, for her father to start a new business driving a tour bus, Azalea at first things it's business as usual. But this move is a little different. For one thing, instead of joining up with the local homeschooling community her mom has gotten them into a different group; unschoolers. Azalea isn't sure about this whole unschooling thing. She's also starting to have some doubts about her father's life choices and his business acumen. Finally, for the first time in her life she's making friends and when her sister starts talking about their inevitable move, Azalea realizes that she doesn't want to move, yet again. On top of everything else, someone seems to be sabotaging her father's new business. Is it her new friend's old friend? Azalea is determined to find out. There's a lot going on in this book - a mystery, familial struggles, changes for both the girls as they become older and start seeing their parents in a different light, and at times the unschooling part of the plot seems plopped on top of everything else. Some of the explanations of it are an info dump (and it's not a new movement - it dates back to John Holt's writings from the 60s and 70s - which is reflected in the unschooling group's leader's hippy persona). I did appreciate the positive spin given to Azalea's family's school choices and the way the family chooses to blend different methods in the end. One thing I am always firmly against in homeschooling is thinking that there's only one way to school children correctly - different methods and choices work for different people. Verdict: It's not a bad story, if a little heavily packed with plot trails, and Azalea is a fun and interesting character. I'm not sure it's so riveting that it would grab the average reader though. A good choice if you have unschooling families in your area. I first saw this series advertised at BEA and fell in love with the bright, busy colors. I've been waiting eagerly to buy them for the library and, while they're not a typical board book, I think they're a great addition to the collection. A simple sentence on each page describes opposite attributes of various animals. "Sloths are slow./Cheetahs are quick./Eels are slippery./Tree frogs stick." The real star of these little books are the illustrations. A rotund purple hippo perches on flattened leaves and flowers, surrounded by apple cores and munching contentedly on an apple. A blue rhino grins mischievously while proudly displaying her tall horns and perky blue ears. A brilliant yellow snail sports a stripped orange shell and a natty mustache, not to mention a couple little eyebrows floating above its eyes. Each creature is surrounded by colorful flowers, leaves, and branches. Verdict: The cheerful colors, simple text, and attractive illustrations make this a delightful new addition to any board book collection. I really love Kit Chase's "Playtime with Friends" series. Sometimes you just need that sweet, gentle picture book for a cozy read. In this latest installment, Charlie, Oliver, and Lulu are all fishing. Oliver is big enough to wade and fish with his trunk, Lulu can flutter and fish with her claws, but all Charlie can catch from the river bank are sticks! He's feeling very down about his pile of sticks, until he comes up with a solution - building little boats! But when Lulu and Oliver come to join him, they're much better at building boats. Will Charlie ever get to fish - or be good at anything? Chase's delicate watercolors show a landscape reminiscent of Ernest Shepard's famous illustrations for Winnie-the-Pooh, complete with little stick boats, a friendly rushing river, and cozy small animals with rosy cheeks. 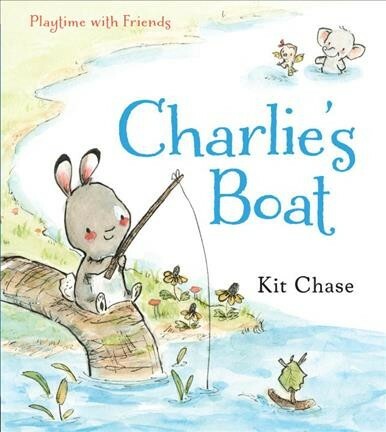 This sweet and gentle story of friendship and helping each other out is the perfect choice for a cozy storytime or a quiet bedtime story - perhaps to be followed by creating your own stick boats to float or thinking about how different friends can work together. Verdict: Not an absolutely necessary choice, but a strong addition to any picture book collection on friendship, working together, and thinking outside the box. Well, that took long enough. 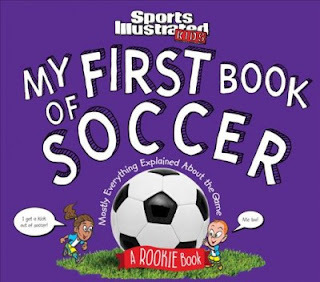 I've long noticed that Sports Illustrated Kids books seem to mostly forget the existence of contemporary female athletes and that's been extremely obvious in their Rookie series. I've added review copies and purchased the ones I needed, but I have been extremely annoyed at the lack of women in the previous three titles on Hockey, Football, and Baseball. I hope that publisher will revise those previous titles to include women more equally (or at all). The narrators are a confused (white) boy, who doesn't quite get the rules of soccer (or that most of the world calls it football) and a sparky, enthusiastic, dark-skinned girl. The book follows the format of the previous titles, explaining how the game works, the rules, functions of the players, scoring system, and a few traditions of the game. It's illustrated with pictures of real athletes, captioned with humorous dialogue, against a background of colorful pages. The big difference in this book is that a good half of the athletes pictured are women. Verdict: These books are very popular and check out constantly, but this is the first one I'm actually happy to put on the shelf. Now, if the publisher just does the same thing with Basketball and goes back and fixes the previous books, I'll be buying extra copies asap. I don't normally review books with additional stuff as it were, but I'm always refreshing and updating my library's circulating toy collection so I've started including a few more things that I use in that area on my blog. I do have a full blog that's all of these items, Read 'n' Play, but I don't review them, more just list them. These two kits from Silver Dolphin sounded like a good addition to a storytime kit or Read 'n' Play bag, so I agreed to take a look at them. Each one includes a sturdy cardboard carrying case, a wooden vehicle, small board book, and vinyl road map. 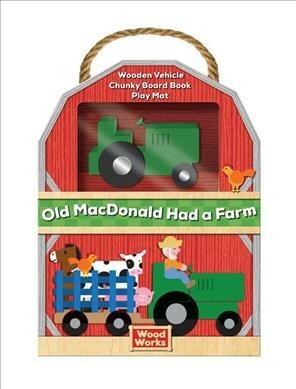 The board books are small and chunky, about 3x4 inches. The include the text of the song, which can be a bit crowded on the pages, along with bright, colorful digital illustrations. The wheels on the bus includes a variety of races and genders, although the driver is a white male. It changes the song slightly to be a school bus. The wheels go around, the wipers go "swish", the horn goes "beep", the children say hi to their friends, and the doors open and shut, leaving out the parents and crying babies. The wooden vehicles are a small green tractor and a yellow school bus. They look pretty much the same in the picture - they seem to be well-made and the wheels appear to be on a solid bar through the toy, which is good for little fingers that tug. The play mats are interesting. Both are made out of a thin vinyl materials - a little thicker than a plastic bag, but not very sturdy. I tested a corner and it twisted and started to rip easily. They have multiple fold lines from being tucked into the boxes. The mat that accompanies the school bus shows a road through a typical town with police station, school, stores, and houses and the farmer's mat shows a gravel road through a farm yard. The carrying boxes are a very sturdy cardboard - the front opens and the side clicks shut with a hidden magnet, I would guess. They have a nice little woven ribbon handle to carry them by. There's just one problem. The initial packaging has a plastic form inside that holds everything in place. However, once you open the item and remove the packaging, the clear window at the top to see the vehicle through is empty - and the toy falls right out. You can pack everything into the bottom, but it takes a little maneuvering. Verdict: I'd like to circulate these on their own, but the open window in the top makes that problematic. I don't think the play mat will last long, but it's an easy item to replace with a print-out or felt mat. 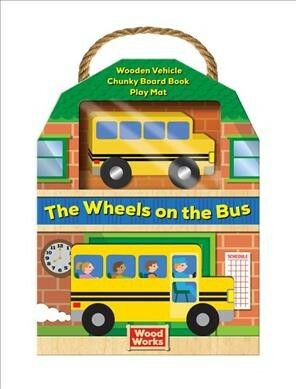 The vehicle and board book should be sturdy enough for many uses. I think they will make a good addition to a kit on nursery rhymes for use in daycares and at home. It has been a week. I will update the program blog later. One more week to go. 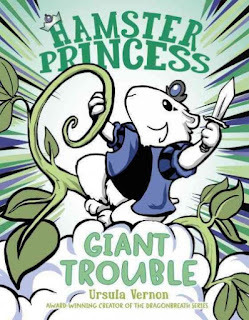 I've been going through a whole slew of beginning chapter books and was interested to take a look at this new series from E. D. Baker, especially since her Frog Princess series has recently enjoyed a revival at my library after we read it in book club. Maggie lives in the Enchanted Forest and loves the magical creatures she sees there. But her woodcutter father is working far away and she's stuck with her mean stepmother, Zelia, and rotten stepbrother, Peter, neither of whom believe she can see the magical creatures. 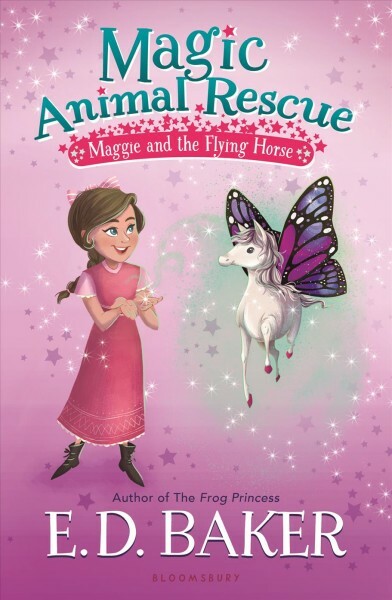 When she accidentally injures a tiny flying horse, Maggie is determined to take it to Bob the Stableman, who she's heard takes care of magical creatures. After a long and dangerous journey, Maggie finally arrives and her life immediately takes a turn for the better. For the first time she has someone on her side, someone who can also see magical creatures. Bob not only promises to take care of the little horse, he's impressed by Maggie's resourcefulness and how she risked the dangers of the forest. Now Maggie has plenty of excitement and magic to look forward to in the future as she observes and helps magical creatures with Bob. This is definitely a beginning chapter book, with a large font, short, choppy sentences, and simple black and white digital illustrations. I can't really say why it didn't appeal to me. It has Baker's trademark blend of contemporary and fairy tale life, and the magical creatures were interesting, but it just didn't have that spark. Maggie is rather a dull character when all is said and done and the "mean stepmother" trope is so worn out. Verdict: An acceptable addition, especially if you have E. D. Baker fans, but I think I'll go with Paula Harrison's new series instead, which had more memorable characters. Until the end of fourth grade, Winnie was just an ordinary kid, along with her friends. Then her parents got divorced and decided to share her. Equally. This means that she spends three days with her mom, three days with her dad, and one day in the treehouse between their homes. At first, she's fine with this arrangement. The treehouse is especially cool and lots of kids' parents are divorced. But when her parents' competitive nature gets out of control, she finds herself not only miserable but failing fifth grade as well. With the help of her uncle's advice, Winnie comes up with a solution - live in her treehouse until her parents come to their senses. To her surprise, she's quickly joined by her friends, who have their own grievances with their parents from annoying younger siblings and cousins to not enough phone time. Soon they are the Treehouse Ten and it's a media circus. Then lines are drawn within the treehouse and Winnie finds herself stuck in the middle - AGAIN. It will take some more advice from her uncle and some thought on her own part before she discovers her true strength and solves the difficulties she and her friends face. This isn't a new plot device; I was reminded vividly of Felice Holman's Blackmail Machine, which involves a group of children trying to save a swamp. Like Winnie's friends, they have to compromise in the end, learning that growing up entails not getting exactly what you want. Graff handles the plot with a deft hand though and the various characters all have strong personalities that shine through, although we don't get to know any of them as well as Winnie. Although Winnie's situation is over the top - she can't get her homework done because her parents are insistent on celebrating random wacky holidays to prove that they're "more fun" than the other parent - the real root of the problem is that no one is listening to her and her parents are trying to force her to choose sides. The concerns of Winnie and the other children are definitely of a suburban, middle class nature. They are trying to be more independent, to be listened to by their parents, to learn how to negotiate familial and community relationships. There are no concerns about money, none of the children particularly struggle in school, and Winnie's parents are both successful enough that they can afford to purchase a new house to put their wacky plan into motion. The group includes a range of racial diversity but the kids all have roughly the same stable, suburban life. Verdict: While not particularly unique in plot, Graff's writing ability and deft touch at characterization as well as the humor and understanding she introduces throughout the book are sure to make this a popular addition to any library. Kids will devour this book with enjoyment and perhaps think a little about their own relationships with their parents afterwards. Recommended. I have a soft spot for National Geographic's children's books in any form, but I love their bright and colorful photographs in board book format. This might or might not be good. Each spread in this book shows a different big cat performing an action, then invites the reader to mimic or perform a similar action. When we see a fluffy snow leopard in the snow, we learn that "Thick, soft fur keeps the snow leopard warm." Readers are invited to touch the snow leopard (a disappointing exercise since this isn't a touchy-feely book) and then rub their own hair. A tiger licking itself gets a suggestion to find the tiger's tongue, then your own. The spreads show photographs that pop out from the page, set against bold blocks of color and simple text. The board book is a slightly smaller format, about 5x5 inches. Verdict: I do love the photographs, but the heavier text and smaller format of the books doesn't click well with the toddlers I've tested this on. Sadly, I will probably strike these off my series to purchase for the board books. I don't usually go for cute, but I've hit a couple of books that just are so adorable they can't be resisted. One is the unicorn/narwhal book you didn't know you were missing, but once you've seen it you must have it. Kelp, an adorable little unicorn with a pink nose and a diving helmet (there's a hole for his horn of course) lives deep under the ocean. He knows he's not quite like the other narwhals, but they all accept and love him so he decides he doesn't care. But one day, he's swept away by a current and ends up on land, where he discovers...land narwhals! He learns all about unicorns and the special things he never knew he could do. Does Kelp belong on the land with the unicorns or in the sea with the narwhals? It turns out...he belongs in both places! The message of acceptance and family is woven into the story with a light touch. Both the narwhals and unicorns accept Kelp's unique attributes (and his diver's helmet). 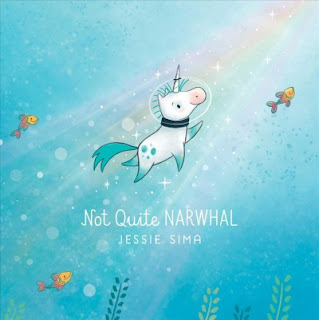 The story is humorous, touching, and best of all has lots and lots of gorgeous narwhals and unicorns! Kids who want pretty unicorns (not the humorous ones that have been popping up recently) will adore the snowy white creatures with their colored legs and rainbow-shooting horns. 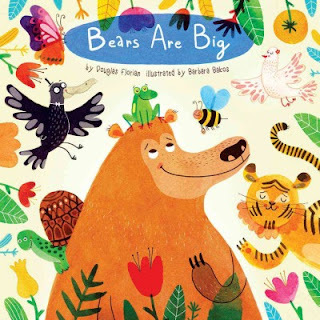 Verdict: Sima's debut picture book sparkles with love and delight and will charm both children and parents in storytimes and on their own. Highly recommended. I always enjoy Newquist's narrative nonfiction titles and this was no exception. Newquist takes readers through the early use of chocolate in South America, its discovery by Europeans, and its evolution to the sweet treat we know of today. Along the way he expands the stories of the people who tasted, created, innovated, and sometimes fought over and stole chocolate! Readers will learn about the massive corporations that grew up around chocolate, the creation of favorite treats like Hershey Kisses and Reece's Pieces, and the actual scientific process of creating chocolate. Newquist even includes a comparison of American and European chocolate and its differing tastes. Throughout the book primary sources are included like photographs, advertisements, and more. There are also maps, additional facts, and other information about chocolate and its role in history. Back matter includes a glossary, sources, index, and acknowledgements. Middle grade readers who like narrative nonfiction will get sucked into this fascinating history. 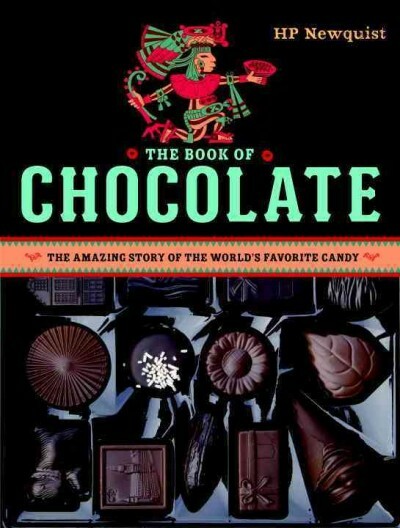 Even readers who are reluctant to tackle nonfiction will be interested by a book on a tasty treat like chocolate. Newquist doesn't shy away from some of the darker sides of chocolate production, like the environmental and human costs, but offers a great survey of an interesting treat - plus recipes! Verdict: Chocoholics will delight in this yummy book and even those who have other sweet preferences will find themselves craving a chocolate treat after reading this book. I certainly did! 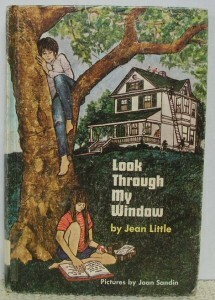 One of the first reviews I ever wrote was of Jean Little's Look Through My Window - also one of the first novels by Jean Little I read. I can still remember exactly where I was and how I felt as I read this story of friends, change, and growth. This was written when I was about fourteen! Emily's life is predictable and normal. The most exciting thing that ever happens to her is being home along for a few hours. But then her aunt becomes ill and she and her parents move to the country, to a big, old house to care for her four young nieces and nephews. She's attending a new school for the first time and is determined to be someone different, someone new. She's spurred on by the discovery of a mysterious box and hopes to make a real friend. But the first person she meets is prickly Kate Bloomfield. Kate has one adult sister, so is virtually an only child. She sticks our in the suburban/rural area like a sore thumb; her father is Jewish, but doesn't practice, her parents are both very "modern" and run a bookstore. Kate is confused and often bitter and feels like she is unwanted by her family and doesn't fit in anywhere. Between Emily's mother's struggles to adjust to life with four rambunctious children, and all the emergencies and catastrophes that ensue, both Kate and Emily slowly change and grow, discussing who they are, writing poetry, finding what they have in common as well as what's different about their lives. Kate especially questions her parents' religious choices and her own identity, while Emily is more sure of herself even when she makes missteps. The girls work their way through their own family issues as well as their religious differences, figuring out how to be more than casual friends and learning that they both still have a lot of changes to expect in their life. Who will read this? Fans of Tara Altebrando's middle grade books and other quiet, reflective stories of girls coming of age. Bring it back? Absolutely. The book addresses questions like religion and identity not often touched on in middle grade titles and sketches in a dreamy summer with a slowly growing friendship with an expert hand. The story is timeless, needing no updating. The only thing I would change is, much though I love her classic illustrations, Joan Sandin's art should probably be swapped out for something a little more contemporary, at least on the cover. Availability? Sadly, this has been out of print since the 70s and it's unlikely to ever see the light of day in the US again. Periodically, I check to see if Canada has brought out any new or reissued Jean Little titles, so that's a faint possibility some day! A typical summer week, moment by moment (except when it isn't). I've been doing lots of work on our various storytime kits and toys and you can catch up with those on my Read 'n' Play blog. 11:30ish - I arrive. Start sorting through stuff on desk, discuss associate applications, look at hold records and VideoETA for av orders. 12:30 - still working on AV orders and July book order. Also going out for summer reading when I hear the bell. 1:20 - AV order sent. Now to finish book order. 2 - break to deal with some patron questions, pull books for weeding, pull books for a science program next week. 4 - Pearl arrives for Read with Pearl (it's been a very quiet day but a few fans showed up. And I gave her lots of pets b/c I needed some furry dog therapy). Put together materials for next week's activity bag, fight with the blasted printer, work some more on tidying up the storyroom, clean stuff off my desk, look at what I need for this week's programs. Paperwork. Summer reading. 6 - putting together Dinosaur storytime kit, ordering materials for replacing and adding new maker kits. 9am - I arrive and take over. Refill all the displays again, set up summer reading. Sort through LotG books and stacks of paperwork on my desk. Repairs, new books that need to be cataloged, etc. Chatting with kids about the hamster. 10am - Pattie does Toddlers 'n' Books. I greet people, answer questions, and keep working on my stacks of stuff. Updating programs and statistics and planning last bits for this week's programs. 10:30 - break to pull magic trick books for the daycare that's coming today and accept a donation of quilts for summer reading prizes. back to paperwork, sorting donations. 11am - 2nd session of Toddlers 'n' Books with Pattie. I'm still sorting donations. 11:30 - got through pretty much all the donations, did a little weeding for the last half hour while helping people. 12 - Kelly (adult reference associate) took over the youth desk. I grabbed some lunch, set up projects for my three volunteers and aide, weeded a few more books. 1ish to 3 - Storywagon: Snake Discovery. This was a new performer for me and the presenter was excellent. I worked crowd control, wrangled snakes, and helped our big daycare group. 3 - 5 back to the children's desk. checked on the queen of summer reading competition and posted on Facebook. Back to weeding, checking in new books. Still sorting donations. And of course I am on the desk throughout all of this, so reader's advisory, answering questions, helping with printers, computers, supervising kids, etc. Well, we had extensive flooding in our area so this is no longer a typical week! Lots of emails back and forth, tour and storytime cancelled, Jess and I finally made it in about 9:30. The basement is flooded a few inches but only a couple boxes of stuff got wet. The roof and windows didn't leak, but we got some water in the lobby, all tile so it's ok.
10:30 - catching up on audio bags, cleaning out storyroom, still some donations to go through, and weeding. 1:30ish My gaggle of tween girls showed up to volunteer. I let them shelve, sort beads, and help me clean out the storyroom. They ran out of steam around 4:30 and started running around the library. Sigh. I finished up. Still a lot of random stuff on my desk, but the storage room looks good! I want it to be more usable for kids and families. 9 - Jess arrives at work. Baby storytime was cancelled this week, but Jess put out toys for people at 10am. 10:30ish - after various adventures, I got to the local pool where I talked to the manager about allowed me to have Library on the Go there in August. 11ish - I arrive at the middle school (where summer school is held) for Library on the Go. My aide, M, meets me there. We had a few kids for the first hour, one that was waiting for us! but we mostly talked over upcoming stuff and how tired we are. We are very tired. 12 - we moved everything down to the cafeteria and things really take off. checking out books, kids decorating wooden tongue depressor bracelets, very noisy! 1ish we got back to the library. M collected her personal volunteer, L, and went to get lunch, Jess went to get lunch, I had lunch. I sorted through some of the last bits of stuff from the storage closet (mostly boxes of paper goods - which do I need and which can be stored elsewhere? ), sorted some of the Library on the Go stuff I had brought back, and stared at the schedule in despair. 3ish my faithful volunteer D showed up, but I had forgotten to tell her that the program was outdoors and super messy. So the Ms and L set up the outdoor program and mostly ran it (pools, stringing lines for paintings, putting out frozen paint and platters of paint, etc.) while D worked through the shelving tasks that she is familiar with. Messy Art Club paint-sicles and sponge painting was on. 3:30-5:30 I went in and out, keeping an eye on the program, cursing the hot weather (I really, really, really don't like heat) and around 4:30 came back inside. I talked with Jess and D about what we were doing with the cut-outs and belatedly caught up on all the stuff I'd brought back from Library on the Go (the computer hadn't worked so I'd written a lot of it down, plus I had to enter all the barcodes manually, update names I had guessed at the spelling, etc.). 5:30 the Ms cleaned up, and I cleaned out my email, uploaded photos to Facebook, and tried to figure out how the heck I had ended up ordering multiple copies of random dvds. I left around 6. A long, hot, icky day. Ah, nice and cool. Well, not inside, but at least I know it's cool outside. 10ish - got to work, packed up and organized all the paper products sitting in the storage room, tidied up displays, working on finishing new maker kits and storytime kits. Also ya weeding and cleaning off my desk. Various enquiries at the desk, not too busy. 12 - aide came in, got her started on various projects. Finished 2 maker kits and some more weeding. 1ish - ate lunch in between wandering in and out, dealing with patron incident, and staff setting up the chromecast for the maker workshop (apparently all technology breaks when i get near it). 3:30-5:30 Maker Workshop: Crochet. This was a new one I was trying. One attendee I think was a little too young - I showed her how to finger knit. One struggled valiantly despite being left-handed and did a really good job for me being such a poor teacher! A couple caught on right away, others took longer and then happily chained away! 5:30-6 ran through applications, posted photos, and went through a bunch of bills plus a few other things before leaving for the week. Pretty much all the Branches series are popular at my library. I have most of them together in the juvenile series, except for a couple long-running and older chapter books, Dragon Masters and Notebook of Doom. Personally, there are definitely some I like better than others and this new series isn't going to fall into my personal favorites, but a certain segment of readers will adore it. Animal Town is a happy place. Until mean King Viking shows up with his robot army! 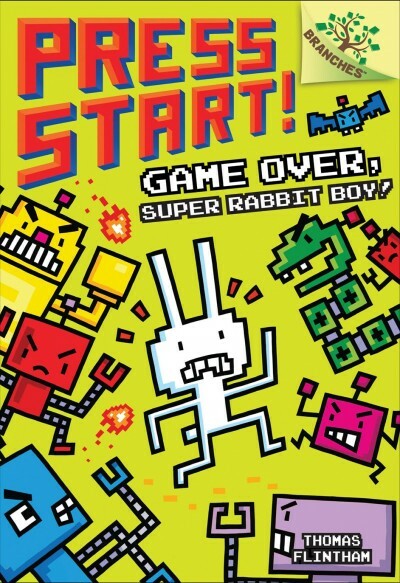 Now their only hope is Super Rabbit Boy - but will he make it past all the obstacles in his path? This is basically a narrated video game. 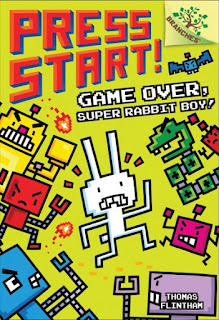 Super Rabbit Boy jumps, dodges, and fights his way through a number of obstacles, continually confused when he has to start over at the beginning. Periodically, the story switches to the dark-skinned boy playing the game, with notes of his frustration as he tries to get past the final level. The art is very bright and colorful, made to look like the pixelated art of an old-fashioned video game. The backgrounds are bright and splashy and the various obstacles more silly than scary. The text is divided between the lighter font of the narration and the darker text of the speech bubbles. To be honest, I found this unutterably boring. The text is choppy and there's no real plot - like I said, it's basically the narration of a video game. Some kids absolutely LOVE this. It's already a popular title at my library and Minecraft and Mario fans gravitate right to it. Verdict: A good fill-in for readers reluctant to put down their video games for a book. There is a chipmunk! EEEE!!! I love chipmunks. Ahem. So, Harriet's latest adventure. For those who are just joining us, Harriet is a princess. A hamster yes, with a battle quail named Mumphrey, but still a princess. She's successfully defeated a curse, rescued a hydra's egg, 12 mouse princesses, and even gotten a magical wish granted - to be able to cliff-dive again (long story, but she's not longer invincible). Harriet is just waiting for the next adventure to come along when she encounters a mysterious chipmunk who tries to sell her magic beans in return for Mumphrey. Naturally, Harriet refuses but when Mumphrey eats a bean things get a little....dicey. Next thing she knows, there's a giant beanstalk growing up to the sky and it's snagged a cloud castle! Harriet climbs up to explain, but when she discovers the inhabitant of the cloud castle is NOT a nice person (anybody who buys people qualifies as bad in Harriet's book) she changes her plans. Now she's going to try to escape the giant's huge castle with her new friend, Harpster, a goose (it lays ordinary but prolifically), and her old friend Wilbur who shows up just at the wrong moment. Will Harriet save the day or will it all end with a nasty splat? Vernon has crafted another hilarious fractured fairy tale with plenty of laughs, lots of illustrations, and a few home truths. Harriet is all set to apologize and move on; after all, giants aren't inherently evil, but once she sees that he's gotten a bit above himself and is buying people! Well! There are also some cogent remarks about making do with what you have, sticking to your promises, and the disgusting nature of soggy shoelaces. Not to mention Wilbur's helpful addition of the liabilities of magic when things look a little iffy with the chipmunk near the end. Verdict: Adults and kids alike can revel in Vernon's delightful series. A great choice for read-alouds, book clubs, and just pure fun. Highly recommended. 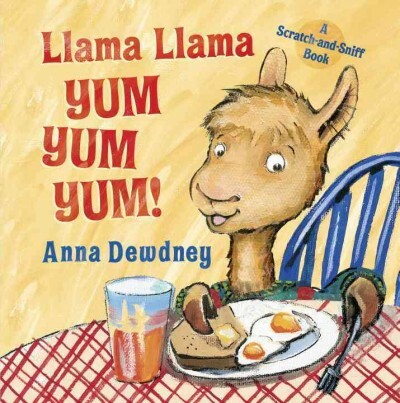 This is a tie-in to the popular Llama Llama picture book series. Each spread shows Llama Llama enjoying a different meal. He eats toast, eggs, and orange juice for breakfast, crackers and juice for a snack, peanut butter and jelly sandwich for lunch, shops for fruit, vegetables, and other items at the grocery store (he gets a free pickle), a banana for snack, spaghetti and salad for dinner, and there's an ice cream sunday and a list of all the food he's eaten at the end. This is a scratch and sniff book, so it smells a bit...strong. Dewdney's thick brushstrokes don't translate well to the finer detail needed for the variety of food in this smaller format; I thought at first it was a tie-in done by a different illustrator, but it appears to be her work. Although this is only a year old, I felt that it was already outdated with its reference to PB&J - something that's rarely served in schools because of allergies - and several mentions of juice which is being phased out as unhealthy for kids. The binding felt flimsy and the pages were thin cardboard. Verdict: If you have really rabid Llama Llama fans, this novelty book is an ok addition, but I wouldn't spend the money on it as I don't think it will last for very long. Jennifer Ward teams up with a new illustrator for another great guessing story, perfect for programming. In brisk rhymes, the text moves through the different types of skin and protective covers of animals. "Some wear a traveling shell./Some wear tough and pointy horns that serve them very well." The story ends with an exuberant, dark-skinned child wearing clothes. 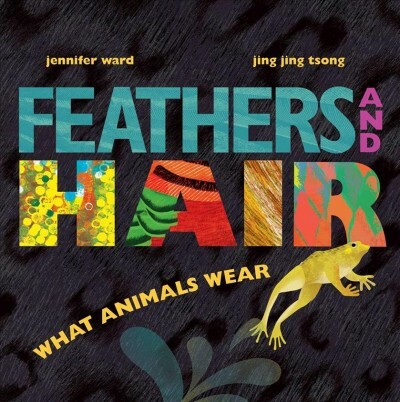 An afterword explains the different types of animal physique in simple language. Readers will learn about different types of feathers and hair, what an armadillo's armor is made of, why a hermit crab wears a shell, why owls have the coloring they do, and even about human hair follicles. Bright, splashy colors explode across the pages in broad strokes, creating big, bold illustrations. This isn't a book to examine closely for small details - it's one to hold up before a large audience and listen to ooohs and aaahs of delight as each new marvel is revealed. Verdict: Add this book to your storytime repertoire - and library shelves - immediately! I currently have five storytime kits in circulation at our library. They're used by preschools but also by homeschoolers and families just looking for fun and educational experiences. A dinosaur kit was requested last year but it's taken me some time to get all the pieces together - and when I finally did, one of the books was too big and I had to get a bigger tub to hold it! 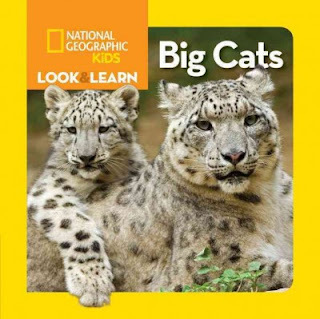 I'll be posting more details on my Read 'n' Play blog when the kit is ready for circulation, but today I'm looking at two somewhat different nonfiction titles from Silver Dolphin that I'm including. Explore a T. Rex is a title I selected because what I really wanted was a dinosaur skeleton and this was the closest I could get (without little pieces scattering all over the place!). The main feature of the book is a layered dinosaur skeleton embedded in the center of the book. Each page lifts off another layer. So the first spread covers general information about the t. rex and then explores the legs of its skeletal system. There is a pictorial comparison of a dinosaur, cheetah, and human leg which is very nicely done. Then this page lifts off the leg bones. The next spread covers the rib cage and discusses how dinosaurs and birds are related. Further pages cover the circulatory system, digestive system, reproductive system, nervous system, and muscular system. The last page has a plastic sort of outline that holds all the other pieces and, appropriately, discusses the skin. 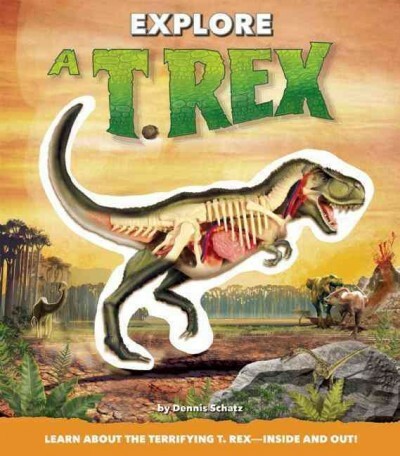 If you look at the back of the book you can see a more artistic rendition of the t. rex's skin. The pieces are attached by little plastic clips (a note on the back of the book says not to remove them). The back "page" of the book is a thick, styrofoam board that holds the whole thing together and provides a space for the model to sit when the book is folded. It's a large size, a little over 12 inches (which is about half an inch too big for my regular tubs!). The text is arranged in small chunks around the central model figure and poses questions like "What was T. rex's posture like?" as well as more exclamatory titles such as "Born to run!" Staff and patrons who have gotten a glimpse of this book are eager to have a turn with it when it circulates! 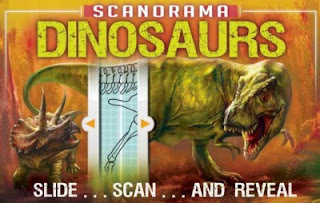 The second title, Scanorama Dinosaurs was sent to me for review. This book is laid out in a long rectangle (about 13 x 8 inches). The introductory spread gives some general information about dinosaurs and introduces the book's interactive portion - an "x-ray scanner". There are four of these scan areas. They show a picture of the dinosaur and have a sliding section that reveals the outline of the skeletal system against a graph background as you move it across the picture. The rest of the book discusses the characteristics of different dinosaurs, mostly in an encylopedic manner with short chunks of text and statistics about different species. There are also a few lift-the-flaps scattered throughout the book. I wasn't as enthusiastic about this title as I was about the T. Rex one I purchased. While I did like the text and illustrations, the hands-on portion of the book was disappointing. The sliding section does not feel sturdy and I am skeptical about how long it will last in little hands. The skeletons are easily visible even without the x-ray cover. There are sections below the picture highlighting different portions of the skeleton, but they don't always correspond to the pictures above them. I like the layout of the information and kids who love to obsess over dinosaur stats will devour this, but the interactive aspect didn't click for me. Verdict: I'll be using both of these in my Dinosaur Storytime Kit and seeing how long they last. Silver Dolphin is a great resource if you are looking for kits or books with interactive elements for these kinds of kits. I didn't care for the Scanorama series, but I really like the Explore title and would look for more of those. 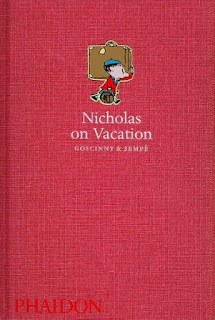 Goscinny, of Asterix fame, wrote a series of books about a boy called Nicholas. There's no definitive plot, just vignettes. Hilarious vignettes. Squirt milk out your nose and laugh until your stomach aches vignettes. 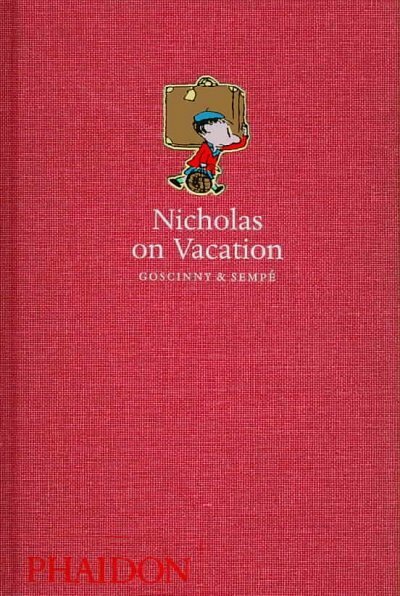 Sempe's illustrations are quick, comic sketches that capture the hilarity of Nicholas and friends, their childhood squabbles, and the exasperated reactions of adults all with a few quick lines. This series is apparently very popular in France and is used in language classes. Sempe is a well-known comic artist there (along the lines of Charles Schulz I think). Who will read this? I've never been successful in getting kids interested in this series, although what I think of as a contemporary comic version, Toto Trouble by Thierry Coppee, was briefly quite popular in my library (I imagine the sudden drop in popularity was due to parents reading it. The first book is called "Back to Crass" for a reason). It requires a more sophisticated sense of humor and is really aimed at adults. Bring it back? Alas, I think the only market is really adults, especially those who wax nostalgic over the humor of series like Crompton's William. However, Phaidon periodically reprints it so those of us who appreciate French comics and humor can enjoy. Availability? 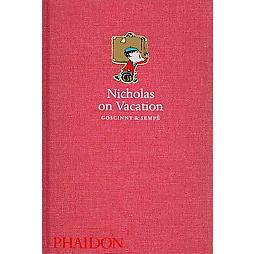 Phaidon did a run of really nice hardcovers about 10 years ago that are now out of print. Used prices online range widely. It looks like they're republishing in paperback in 2019 so I'll be interested in what the covers look like. This is kind of our off week. Pattie, who does all my storytimes for babies and toddlers, is from the school district and so does not work this week (which falls between summer school sessions). A lot of people take this week off so there's not a lot going on in the library. This year I collected what volunteers showed up and what staff I had on hand and cleaned out the storage room. On Wednesday my car died. Two kids found a severely mauled cat. My associate has to leave sooner than expected. As does one of my aides. I had around 25 people at the marbling workshop (not all at once). We had record-high circulation for easy readers and juvenile fiction. I am very tired. Halfway point for summer reading - 480 kids registered, 124 middle schoolers and teens. Approximately 10% online registrations. 18 kids grades 4K-5th and 1 age 0-3 lost or kept their june calendar and picked up a july calendar and passes. 3 kids ages 0-3 turned in their june calendars. 34 4K-5th kids turned in their calendars. I've given out WAY more than 4 rubber ducky prizes, so either I've lost a bunch of calendars or they didn't get marked on the spreadsheet! Or they had 4K sheets. That's possible too. I am so in love with these books. Nobody does cozy and a little magical like Kallie George and these are just delightful. 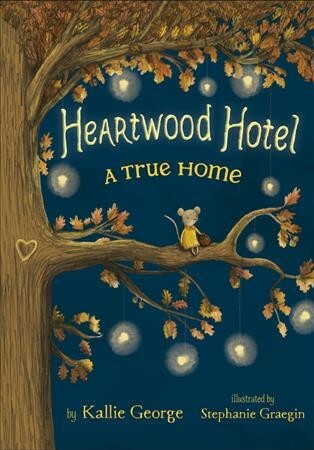 In the first story, A true home, little Mona Mouse is lost and alone in the woods, having been flooded out of her latest temporary home. All she owns is a little walnut suitcase with a heart carved into it. When she washes up on the doorstep of the Heartwood Hotel, she can hardly believe it's true when she's invited into the grand hotel and allowed to stay for a night - and then for the season as a maid. She makes many mistakes, but also does a great deal of good and is determined to keep trying and make a home at the hotel. But cranky Tilly the squirrel, the other maid, clearly doesn't want her there and there's something dangerous in the forest. Will Mona find a new home or will she have to leave once again? 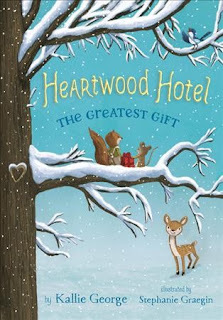 In the second story, The greatest gift, it's the coldest part of the year and the Heartwood Hotel has settled down to hibernate and rest. But there's still lots of work for Mona and Tilly, the maids, and Mona just can't seem to keep out of trouble. First, she accidentally offends an important guest, then she finds out that there are a lot of things her orphaned childhood left her ignorant about. When she tries to make a gift for her new friends, she finds herself suspected of being a thief! Where is all the food disappearing to? What will they do when the guests unexpectedly wake up early from hibernation? And who is stealing all the food? It's up to Mona to solve the mystery and discover what friendship and home are truly all about. Stephanie Graegin has proved her ability to create exquisite miniature drawings in the lovely picture book Little fox in the forest and fellow miniature lovers will coo over her detailed drawings of tiny creatures and their accessories. Readers looking for a cozy story of family, home, and woodland celebrations will fall in love with this delightful new series. Verdict: This might well be my favorite new beginning chapter book of the year. Full of heart and hope, Mona learns about home, friendship, and reminds the other creatures of the Heartwood Hotel what their tree home is all about as she welcomes guests, learns new skills, and experiences the joys and adventures of life in the woods. Highly recommended. This was a sweet and light gem of a middle grade novel. Brian is absolutely miserable at the prospect of spending his summer with his aunt, uncle, and cousin Nora in Boring, Illinois. His brothers are doing cool stuff - spending the summer with friends or at cool internships. Even his dad is taking off for the South Pole, which is the reason Brian is stuck in Boring in the first place. When he arrives, things get even worse - his uncle has decided to test his new educational computer software on Nora and Brian and they have to attend summer school every day. Nora is unfriendly and completely uninterested in soccer or anything interesting - all she wants to do is write in her secret notebook. Boring is, in fact, extremely boring. Then Brian has an argument and runs into the woods he's been told to stay out and, of course, gets lost. The next thing he knows he and Nora have discovered the craziest old house/castle/ruin they've ever seen and summer gets a lot more exciting. It's not long before the eccentric Van Dashes are a big part of Nora and Brian's life and the two are trying to keep their wacky house from being torn down, even if the Van Dashes don't seem to notice they're in imminent danger. While Brian's aunt and uncle would be perfectly happy for everything in Boring, Illinois to be the same old boring color, shape, and behavior, Brian and Nora have decided they want something a little bit more interesting. Brian struggles to figure out what makes the Van Dashes tick and Nora wavers between her interest in the literary family of explorers and her own loyalty to her family. It all ends in a climactic stand-off (complete with explosions, wild boars, battering rams, a missing author, and a midnight break-in at City Hall). This is the kind of rambling summer adventure that I remember reading in the summer. 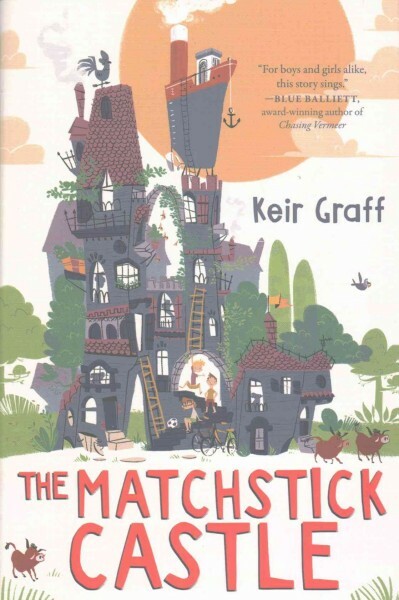 It's not necessarily realistic, but it grabs the imagination and will be thoroughly enjoyable for kids who want to imagine an exciting alternative to their everyday life and those who enjoy mysterious and rambling houses with lots of secrets. It's also quite funny! Verdict: A good addition to your summer reading repertoire, light and funny with some humorous digs at following the crowd and doing your own thing. I was very interested in this new series that combines nonfiction and Lego minifigures. I wasn't sure if it was going to be any good though, so I waited until I could borrow some from another library. I ended up with the dinosaur title seen here. It's a fairly typical nonfiction book about dinosaurs. It's a Scholastic reader level 2, which is very high and I would say was closer to 2nd or 3rd grade reading, rather than an emerging reader. 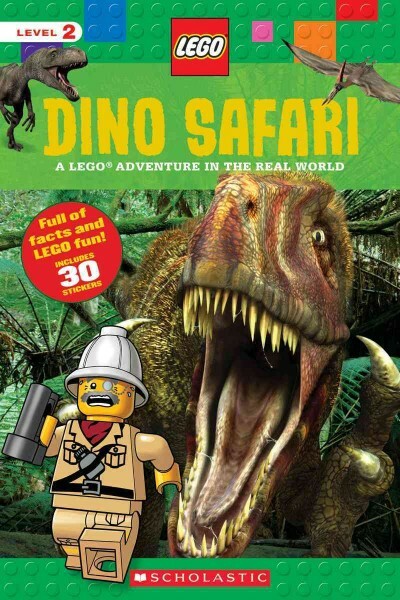 Each page is packed with a full paragraph of text, multiple captions, and lots of additional pictures of both dinosaurs and Legos. The minifigures carry on their own humorous dialogue in speech balloons. There are also Lego building suggestions, a glossary, list of dinosaur names and their pronunciation, and an index. The main lego minifigure is a British colonial stereotype with monocle and hat. This is disturbing. There is also a red-haired female scientist and other Lego figures. My take-away is that this isn't really an easy reader at all. It's too cluttered, has too much complex vocabulary, and is just overall busy. But that doesn't mean I won't buy them! Verdict: These are a great addition to my easy reader tubs, where I put Disney, superhero, Star Wars, and other television tie-ins. They're meant for kids either with higher reading levels or for adults to read with their kids and not necessarily to work on reading skills. They'll definitely circulate briskly. Before discussing this book, I have to explain that I was watching Shaun Tan's animated short Lost Thing while I was reading it. This probably accounts for the quiet air of melancholy that I felt wound through the book. Nicholas' dad, is brave. Nicholas is not. He's scared of the dark, of the things he imagines lurk behind corners. But he figures out he can be brave with some help - the help of his toy dinosaur. He carries it with him everywhere, even tucked into his sock during a soccer game. And then he loses it. The dark is too much for him and his dad realizes something is wrong. When Nicholas breaks down and tells his dad about his fears, his dad takes him back to the soccer field to find his dinosaur. Santat's glowing pictures show multiple night-time and shaded scenes, with the giant shadow of the dinosaur standing strong behind Nicholas the whole time. 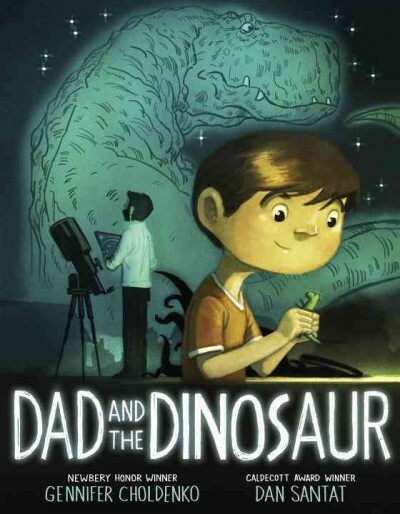 When Nicholas loses his dinosaur, he is followed home in the car by a sinister red glow and creepy shadows encroaching from the edges of the dark. This is not a typical storytime book; it has a quiet darkness and desperation about it, although it also beautifully portrays a loving relationship between a father and son. However, if your audience doesn't have these particular fears they might well have them after reading this book! I would recommend this for one-on-one reading with your own children or a group you know well. Verdict: A lovely and valuable book which I recommend, but not for general storytime use. 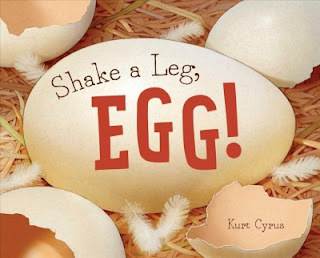 From the title and some of Cyrus' previous books, which we've greatly enjoyed at the library, I'd been expecting a rollicking, silly rhyming story about hatching eggs. Instead, I found a lovely, upbeat story about a hatching gosling. A cozy nest, anxious mother goose, and fuzzy goslings are eagerly awaiting the arrival of one last sibling. "Hello in there!/Are you aware.../how long we've all been waiting?". Amidst an exuberant spring, hatching eggs, rippling brooks, and swirling flocks of geese, a baby gosling finally pecks through and joins her family. A simple, sweet story of hatching eggs and new family members. Perfect for storytime and spring. Verdict: Delightful rhymes, simple story, and luscious illustrations make this a great choice for storytime and any library collection. But I went (I mean, it was too late for a refund so....yeah). It wasn't the worst experience in my life. Maybe in the top ten. I made it through. I did get some good ideas and feedback from sessions and made some good connections in the exhibit hall. I feel like I should have gotten more out of it, but I was soooo tired and stressed. Oh well. Most of the panel wasn't really helpful - they did provide some resources which I'll be trying, but the experience of directors, state librarians, etc. isn't really relevant to me. But the one youth services librarian (from Canada of course) was super helpful. She had practical tips about her work with autistic teens from programming to volunteering to hiring and we talked for a long time afterwards about ways to serve this population in our libraries. This was the Chicago summer library presentation. While I didn't find a lot of the discussions of their program useful (and frankly am a little suspicious of exactly how "successful" the program really is, just from what I've picked up from front lines Chicago librarians in passing...but it's a totally different community of course) BUT they had great suggestions on collaborating with schools, collecting and analyzing data, and creating a more cohesive summer reading program that extends throughout the year. I also find the science aspect interesting and would like to use some of the ideas to streamline my reading programs and other activities throughout the year. WePlay. I was really glad I took the time to dig around in the random database and academic exhibits to find this one (why weren't they with the furniture? I have no idea!). They feature a lot of playscapes and toys built out of sturdy plastic. But, what really sets them apart from all the other toy companies I've looked at is that their products are designed around very specific developmental needs, based on universal design, and the very knowledgeable vendor gave me a lot of resources for connecting their materials with our children with special needs, as well as suggestions on connecting to this patron group. Expensive, but absolutely worth it. I will be spending a lot of time poring over this with Ms. Pattie. Zoobean/Beanstack. My simple online registration with Google forms has been very successful - about 10% of our total registrations were online so far this year. Jess and I have been looking at different online options and Beanstack looked like the best option for me, but I wasn't sure we could ever afford it. I got some good information from another librarian at a discussion meeting and then more from the vendor. I don't know that we can do it next year, but possibly the year after that I'll be able to write it into the budget. It sounds flexible enough that it will work with our nontraditional program. Browser Display Systems. I think the rest of the staff would have a collective breakdown if we tried to redo our dvd collection in these....but I'm really interested in just maybe doing the juvenile cds. Or gradually shifting over the children's dvds. So I can have more space for the Stay and Play ideas! And We Play systems! Ideas are percolating in my mind as I write! For the future of course. Not any time soon. Brown Dog Gadgets. I am not, as some of my colleagues claim, averse to technology. I simply want there to be a reason for purchasing it, other than "this looks really cool!" Also, I hate 3-D printers. Pleasingly, I discovered a vendor who, if they did not actually agree with me, was at least excellent at pretending to do so. And they're local! They have an excellent array of tech kits, exactly what I've been looking for to add to the teen maker space, and I got a nice educator's sample pack including bristlebots, solar cockroach, and several sewing projects. Nice! I will be using them to restock the teen maker space next year. Yeah, yeah, I know you're all going to be like "but what about the books!" and well....I get a lot of review copies (which I do NOT have to lug all over Chicago, bruising myself in odd places) so....yeah. Also, I kind of have a thing about celebrities, including authors. I refuse to stand in lines and I feel the whole author signing thing is just....weird. Ugh. However, I was pleased to meet Asia Citro and chat with her about science and fiction blends. I was disappointed that I missed Laurel Snyder (they moved her signing time!) because I wanted a signed copy of Charlie and Mouse for my colleague, who has two little boys. And, of course, Jon Scieszka is always a hoot and a nice guy to chat with. I did go back on Monday morning primarily to buy discounted nonfiction, specifically from Lerner. I picked up a lot of titles I had on my order list and many others. At 3 for $20 it was a really, really good deal! I love this series soooo much and since Zoe starts with a Z...and I really, really want to use it in book clubs in the fall....I think I'm going to dig out money to add it to the series section even though it is not January. This is a measure of my true love! I was also quite pleased to meet Asia Citro and have her sign a book! (I will probably use this one as a prize, not add it to the collection, because it's signed). Also, Ms. Citro and her colleague had absolutely adorable skirts. SUPER adorable! This was a free giveaway of a hardcover. I bought a copy for the library and skimmed it - I found the twist at the ending really threw me, but I think it will be popular. I'll either add this as an additional copy or use it as a prize. I'm going to see how popular it is this summer. The author was signing free paperbacks. Steampunk rarely does well in my library and I have never forgiven Brett Helquist for illustrating my beloved Green Knowe series, but I will give this one a try. Jon Scieszka was signing and there wasn't a line! He's a fun guy and I appreciated a couple copies to use for Bookaneers. Aww, I really, really wanted a copy of this and my picture book budget is mostly gone. Woo-hoo! Jessie Sima is as cute as her book too. Koehler was signing and I got a copy for my colleague's kid. It's a different art style than in his previous books. Interesting. This was a signed giveaway at Permabound (at least I think it was Permabound...) I haven't decided if I'll use it as a giveaway or an additional copy since I want to use this in a book club. I was at ALA. Hauling books and tech samples across Chicago. Library on the Go really took off today! But only 6 people came to Lego Club. But they had a ton of fun and we enjoyed chatting! The heavy storms have taken a toll on our attendance and circulation. This program was a joint effort by the adult and youth departments (mostly the adult department). We had hoped to attract families and maybe even some teens and we did get middle schoolers so yay! I didn't stay for the whole thing, just the beginning while I was helping to clean the room and set up and then handling summer reading. Personally, I feel that if Bigfoot were real scientists would have found poop. No Bigfoot poop, no Bigfoot.